Amongst our variation of heli tours, one of our most renowned is the Mount Kailash yatra. 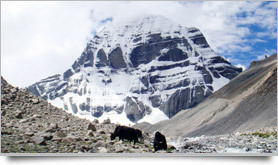 Mount Kailash, the abode of Lord Shiva and a place of eternal bliss, is the most sacred peak for the Hindus. Located in the far west corner of Tibet, the 6700-meter high Mount Kailash is regarded by the Tibetans as the manifestation of Mount Meru, where founder of Bon religion, Tonpa Shenrab, is believed to have descended from heaven; Buddhists as the abode of Samvara and by the Jains as a sacred site where their prophet, Rishaba, attained spiritual enlightenment. Parikrama around Mount Kailash over a 5630 meter Drolma La (pass) is said to erase the sins of a lifetime. Equally holy is the Manasarovar Lake. Bathing in the sacred Lake Manasarovar is considered an essential part of the entire pilgrimage. The lake is set on the Tibetan plateau bordered by the majestic Gurla Mandata. Hence collectively called the Kailash mansarovar tour or Kailash mansarovar yatra. Your Kailash Yatra begins with a flight from Kathmandu to Nepalgunj and then to Simikot, followed by a heli tour to Nepal-Tibet Border. A 4WD Land cruiser or tourist coach then takes you to Lake Manasarovar, where your spiritual journey begins. The Holy Muktinath, a sacred place both for Hindus as well as Buddhists, is located at an altitude of 3,750 m at the foot of Thorong La pass in Mustang district. The Hindus call the place Mukti Kshetra, which means the “the place of salvation“, while the Buddhists call it Chumig Gyatsa, Tibetan for ‘Hundred Waters’. 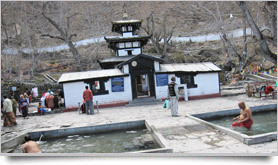 The main shrine of Muktinath is a pagoda - shaped temple dedicated to the Lord Vishnu. Water from the Gandaki River spurts out of the 108 waterspouts near the temple,where Hindu devotees take their ritual bath. Muktinath is also one place where one can find ‘saligrams’. Saligram (Ammonite fossil) Is a black stone that when broken open, reveal the fossilized remains of prehistoric ammonites formed about 130 million years ago. Hindus believe that Lord Vishnu reside in the ‘saligrams’. Jwala Mai Temple, Marme Lhakhang and Gompa Sarwa are the other religious shrines located in the vicinity of Muktinath Temple. You can either hike up there from Jomsom which will take you about 5-7 hours or simply choose our offer of heli flights to Muktinath. Heli tour to the sacred Muktinath has recently been gaining popularity. Helicopter tour is not only a great way to save time but also gives you an impeccable view of the whole region from a bird’s eye, something only a handful of people experience. Some say the muktinath heli tour felt like a ‘fairy tale’. One can only find out, right!